Take the Byron Bay extra off the Pacific Highway and follow the road into the centre of Byron Bay. At the second round-a-bout, turn left and head up the hill toward the Byron Bay Surf Club. Our driveway entrance is at the top of the street on the right. Beach Suites is the ultimate in luxury Byron Bay accommodation, offering a range of stylish boutique studios and large airy apartments. Beach Suites provides modern conveniences, flat screen TV’s, DVD’s, free wireless internet, Foxtel, intercom access and secure undercover parking, in an unrivaled central location. For the utmost privacy, four top floor penthouses each have their own large, rooftop pools filled with captured rainwater. A private lift from the undercover car park discretely opens to each penthouse. An immaculate penthouse with its own private rooftop pool. 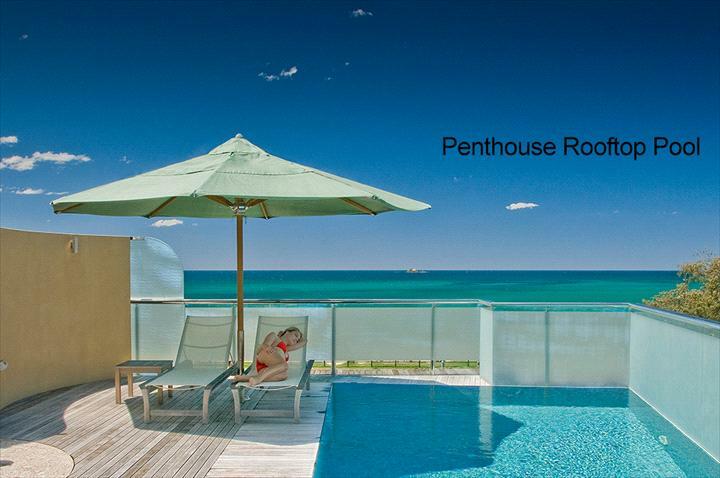 Offering panoramic views, modern kitchens, vast living areas and spacious bedrooms with luxurious bath-spa bathrooms. 2 king beds. Ground floor beachfront studios allow direct street and beach access through gates that lead from large timber decks. These have barbecues on their patios and well appointed kitchenettes. Max 3 adults or 2 adults. 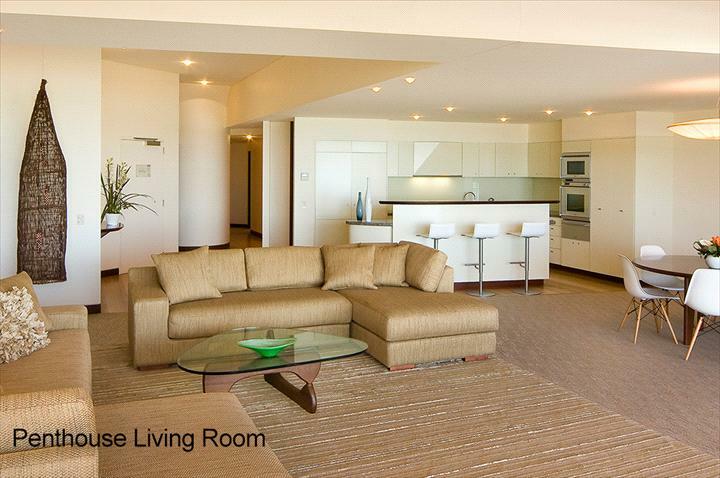 Ground floor beachfront studio with direct street access from large timber decks with heated plunge pool. These offer a barbecue on the patio and a well appointed kitchenette. Max 3 adults or 2 adults, 2 children. 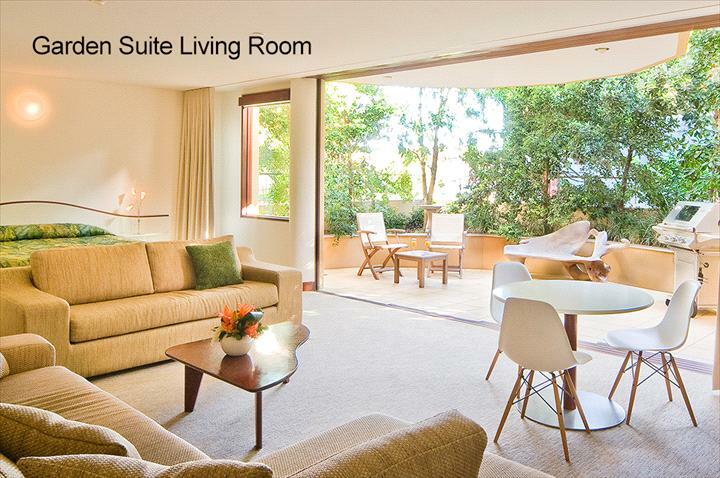 Spacious tiled terrace and patio barbecue feature in our tropical garden suite. Bath spa in bathroom. Well appointed kitchenette. Max 3 adults or 2 adults, 2 children. King bed and queen sofa in living area plus king bed in bedroom. Bathroom with bath spa. Spacious tiled terrace and patio barbecue and a well appointed kitchenette. Max 5 adults or 2 adults, 3 children.